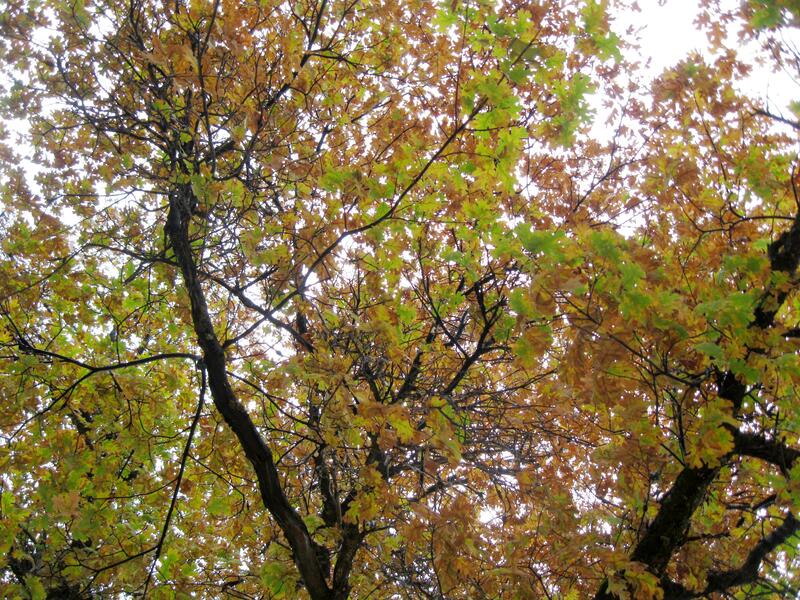 I went searching for the signs of fall on one of the dreariest days of the month. I could have stayed home by the fire watching old movies, but needed to get out of the house and get some exercise. A little bit of fall colors. The drive to Hetch Hetchy was slow. At 6,000 feet the fog was thick and I could barely see the road in front of me. One October during a backpacking trip my brother-in-law teased saying, “it’s not fog, you’re in the clouds.” I thought of him as I drove at a snail’s pace while the wipers washed away the liquid droplets of cloud from the windshield. I thought to myself, What are you doing out in this weather? 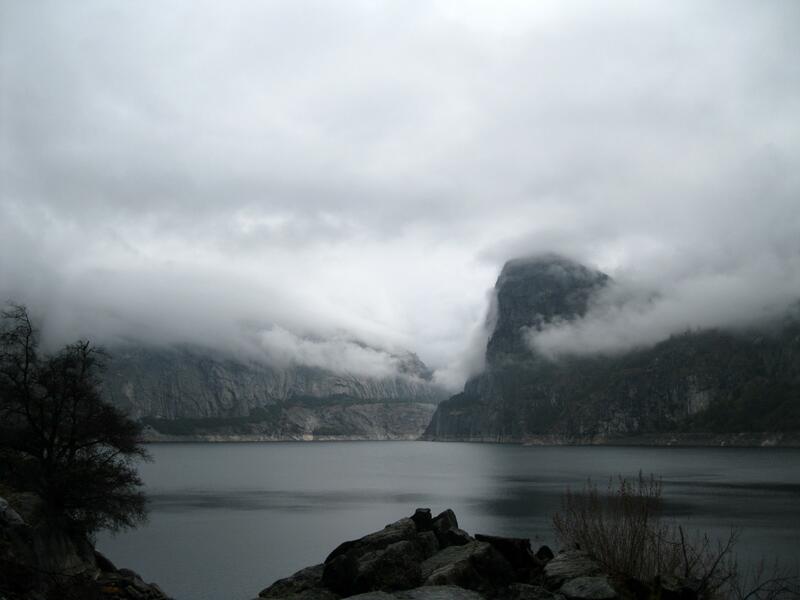 When I arrived at the Hetch Hetchy entrance station, I mentioned to the Ranger that I picked a bad day to come. He disagreed and said it was a beautiful day then cautioned me to drive carefully. 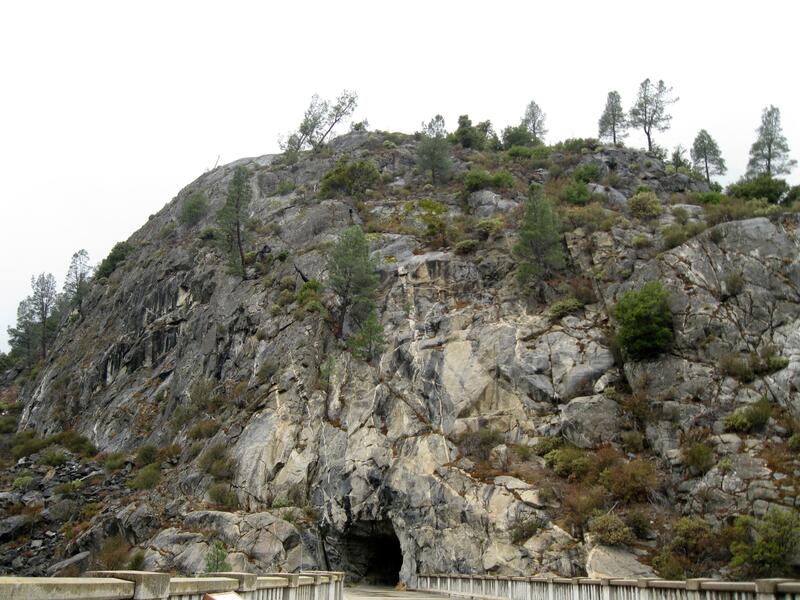 I bundled up warmly before leaving the car then walked across the O’Shaughnessy Dam and through the dank tunnel. 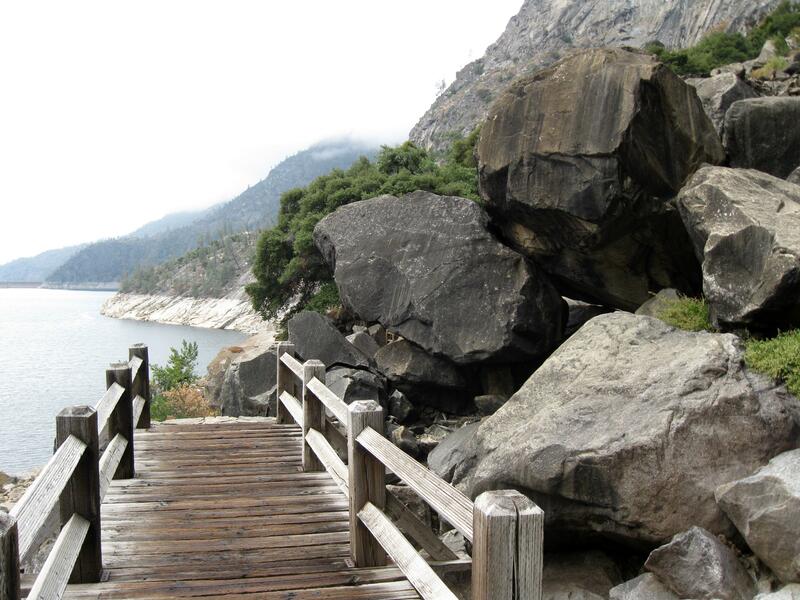 The water in Hetch Hetchy Reservoir was extremely low. 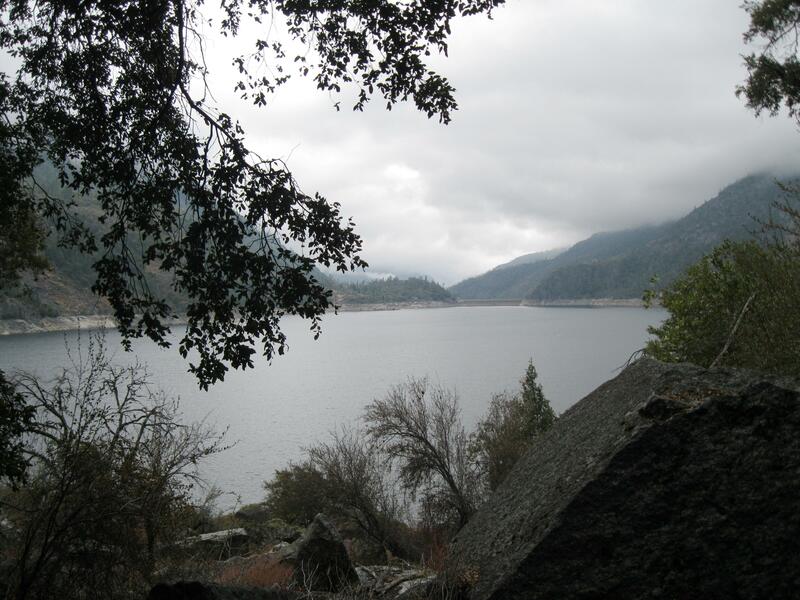 The two waterfalls that spill into the reservoir, Tueeulala Fall and Wapama—the second most powerful waterfall in California, were dry. Hetch Hetchy Reservoir and Kolana Rock on the right. There wasn’t much in the way of fall colors on the trail, but the vigorous walk was peaceful. 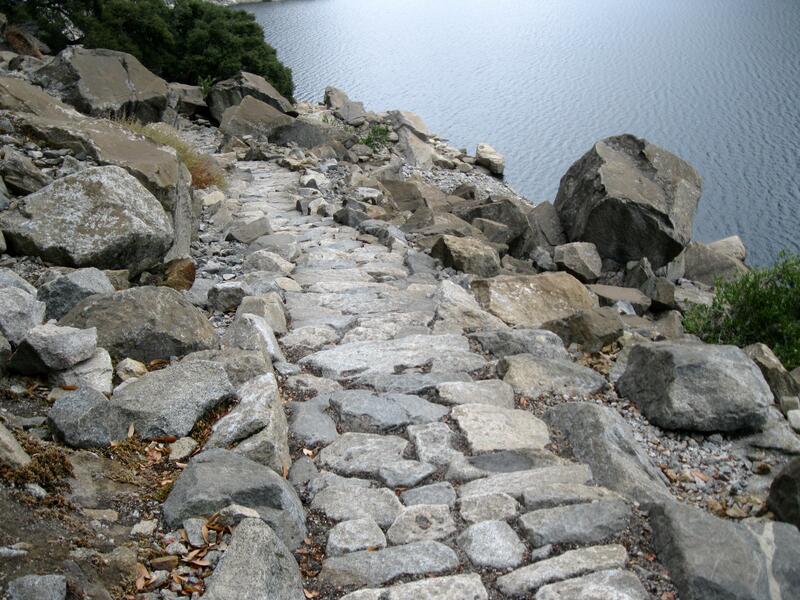 The path led up and down over rocky areas and granite slabs, and in and out of sandy forests always in view of the water. The top of Kolana Rock played peek-a-boo as the clouds gradually moved across the sky. The sweet scent of wet grass permeated the air. A cold breeze blew on occasion, and I heard the thunderous sound of falling rock. 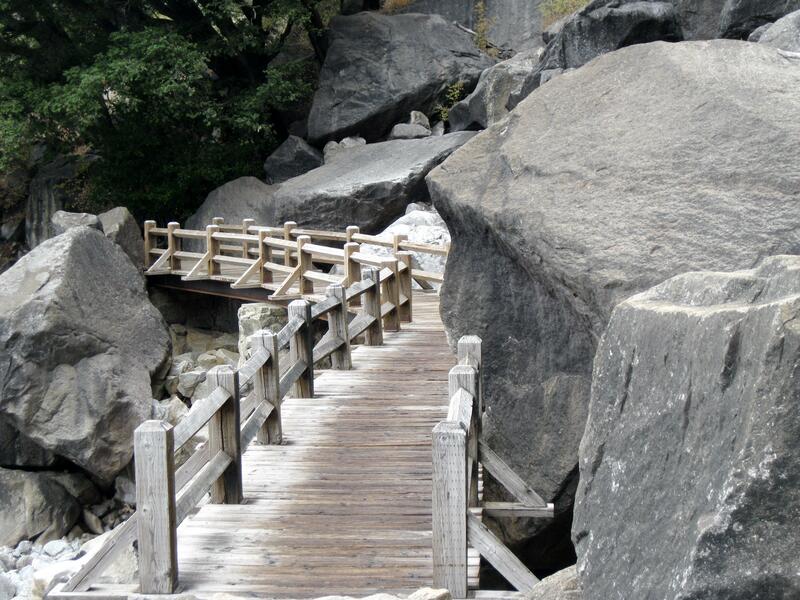 Granite steps leading down towards Wapama Falls. Strolling through the scented meadow of dormant grass. From a bridge, steps leading to more bridges. Water flows easily over these when the fall is full. Looking back at the last set of bridges. Rancheria Falls, was only four-and-a-half miles from the bridges. There is a backpackers’ camp there that I would have liked to check out. Having gotten a late start, it was too long of a walk for this trip. Instead I found a spot on the deserted trail and sat with an obstructed view of the water while eating lunch. View of the water during lunch. The sun never came out, and on the return walk it began to lightly rain. Although wet and cold outside (46 degrees), like the Ranger said, it was a beautiful day; and I think I did indeed find fall. 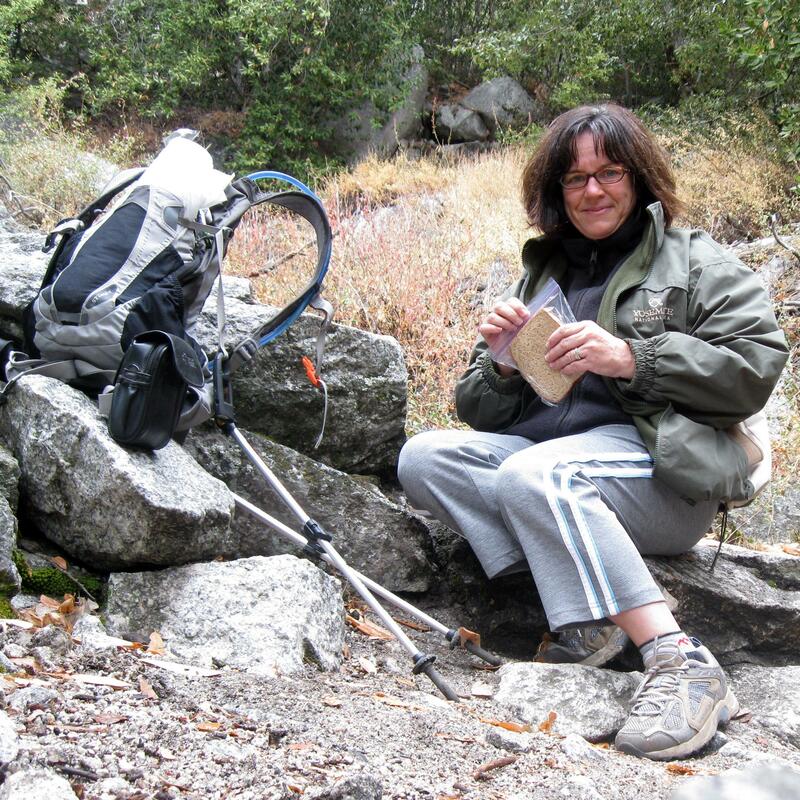 This entry was posted in Yosemite Hikes and tagged Bridges, Hetch Hetchy Reservoir, Hiking, Kolana Rock, Wapama Falls, Yosemite on October 13, 2012 by Janet. Actually, from the pictures, it did look like a great day for a hike. I’m not sure I would have taken on those bridges, though, even though they were dry. I KNOW I wouldn’t try crossing them if the water was like what’s shown in the video. Looks like a great place for hiking! Thanks for the post. This is one area I have always wanted to explore. 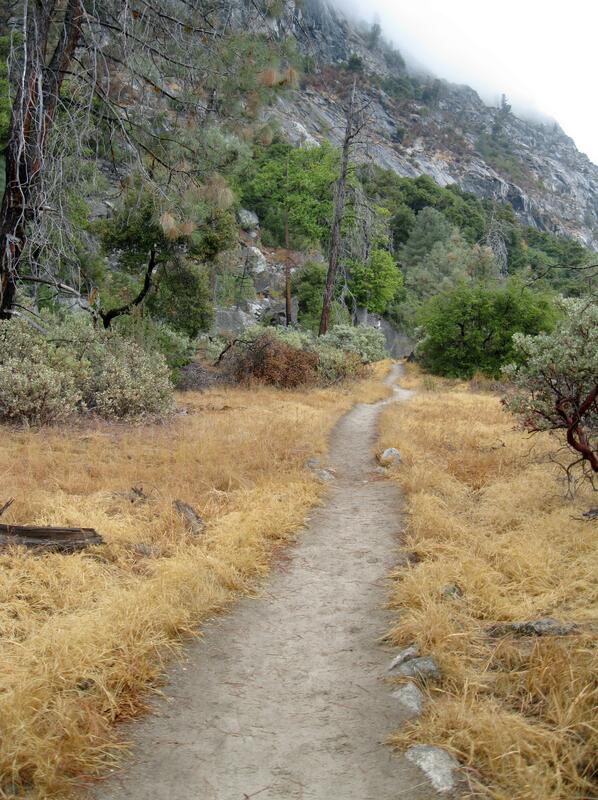 I have heard lots of stories from heat to bears to poison oak. Now after viewing the video, I can add raging water on bridges. I think your take on the trip looks spectacular. Would this be a trip you would recommend in the spring, going to Rancheria? Your site looks amazing by the way. I am still bummed out we did not connect on the trail this summer. Hi there! I’m bummed too that we missed each other. But there are more hikes in the future and maybe one day our paths will cross. 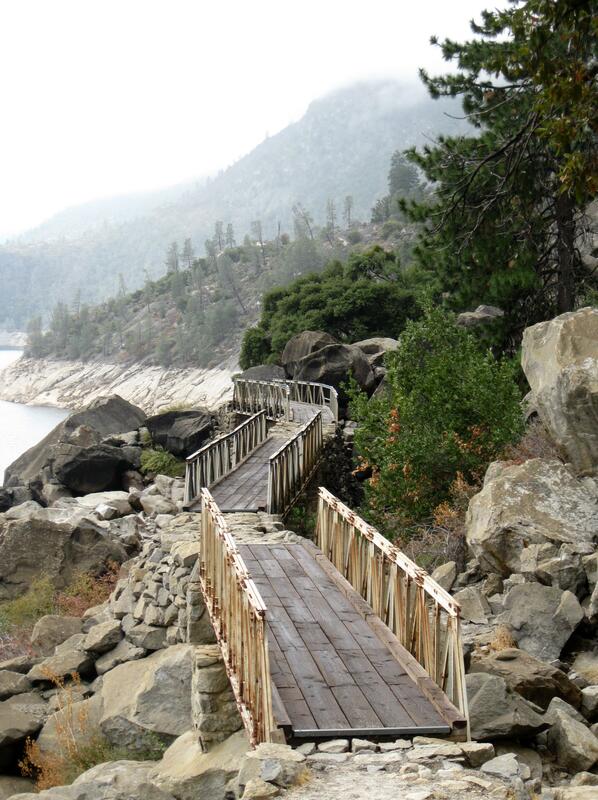 I love the Hetch Hetchy area at any time of the year except summer. Too hot! 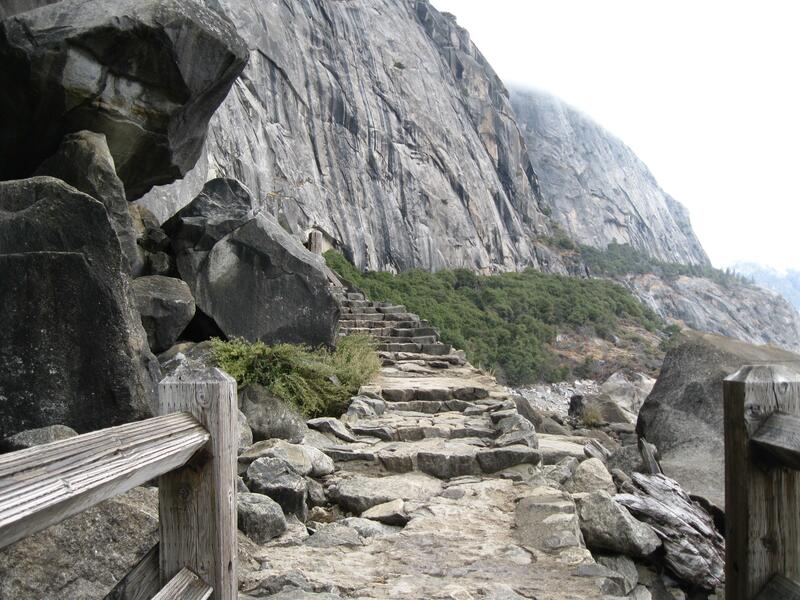 However, I wouldn’t cross any bridge that looked the those in the video, especially after reading “Death In Yosemite.” Otherwise, yes, spring would be good for hiking to Rancheria.